Bass fishing is one of those sports that might seem intimidating to beginners if all you have seen is the Bassmasters on TV or the “pros” on YouTube. Learning how to bass fish doesn’t have to be that complicated. Getting started with bass fishing is easy and can be very rewarding. The excitement of your first trophy catch can lead to a lifetime of pursuing these green and brown fish. Learn these bass fishing basics first, and spend as much time on the water as you can to learn how to read the water and the fish. As you learn how to catch bass using the basics, you will be able to add more advanced techniques to your skillset. Let’s get started! Where & How Will You Fish? The first thing to think about is where and how you will be fishing for bass. Lots of people start by fishing for bass from shore or from a dock, and there is absolutely nothing wrong with that. It is even better if you have access to a kayak or small boat, but don’t let that stop you. 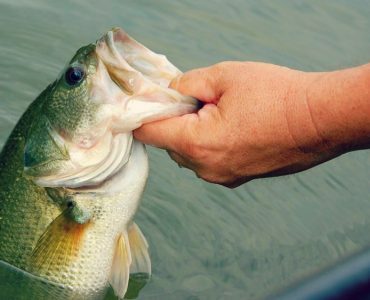 Let’s review the options, and how to approach each one for learning to catch bass. Fishing for bass from shore is great. It costs nothing, and all you need is your rod and reel and some tackle. Look for parks, boat ramps, and bridge overpasses as places you can try first. You can learn several techniques while bank fishing. Fishing a topwater lure or spinnerbait around vegetation is an obvious choice. If there is some depth to the water you are fishing, you can slowly drag and hop a texas rigged soft plastic back to shore. If there is other pieces of shallow cover nearby you may want to try pitching a Senko or your texas rig to all the possible hiding places. You can do all the same things fishing from a boat dock as you do from shore. The only difference is you will be further from the bank, and that can be a good thing. Look for clumps and edges in the weed growth. Keep an eye on depth changes, as many docks are positioned at the edge of shallow areas. Drop offs are great places for catching bass. If your dock is one of many in a row, you can practice casting under the neighboring docks with a Senko. Always be polite and courteous to neighboring docks. Don’t cast under a dock if you aren’t confident you can do it without getting snagged. If you have access to a kayak or small fishing boat, the fishing options increase dramatically. You are no longer limited to the small areas near the parks and piers. Since you are a beginner, it would be best to keep things simple and stay near shore. I’ve broken down the basic gear you will need to get started bass fishing into 3 main categories. Rod and reel, line, and lures. You can go buy all of these items in one trip, and fish all year long in a variety of different places. The idea is to get just enough good gear to be dangerous anywhere you go. Now let’s get started! The first thing you want to invest in is a decent rod and reel. I recommend beginners choose one good spinning reel and rod to start out with. An angler can add more spinning combos to the arsenal as they progress. When you are ready, a baitcasting rod and reel gives you more versatility and room to grow as an angler. You will see that I like certain brands for my rods and reels, and that is based on my 12+ years of experience in bass fishing. Shimano, Abu Garcia, Pflueger, and Fenwick are quality brands that I have relied on over all these years. I’m not saying other brands aren’t any good. I have heard great things about 13 Fishing and Lews, I just haven’t had much opportunity to test them. I’m only telling you these are the rods and reels that I’ve used in the past and are affordable, high quality options to get started with. Spinning reel combos are versatile and easier to cast a variety of bass lures with. Choose a 6′-6″ MH Fast Action spinning rod for the perfect balance between easy casting and backbone to bring in the fish. If you can spend $150-$200 for your rod and reel, you will have a quality setup that will last you for many years. We recommend any combination of these rods and reels for your first bass fishing spinning setup. Fenwick HMG Spinning Rods – HMG rods are some of the best bass spinning rods for $100 or less. They are lightweight, sensitive, and high quality. Fenwick HMG are excellent spinning rods for beginner bass anglers. St. Croix Mojo Bass Spinning Rods – Mojo Bass Rods earn our recommendation because of the SCIII graphite blanks and Kigan 3D guides. The other nice thing about Mojo Bass is the technique specific rod styles. You could get a MJS71MF for plastics fishing, and a MJS71MHF for a little more power. Abu Garcia Vendetta Spinning Rods– The Vendetta series has proven to be some of the best spinning rods under $100 in recent years. For the money, they are sensitive and lightweight, perfect for bass fishing. They fish great and look great paired with some Revo spinning reels. Pflueger President – The President is an outstanding spinning reel for beginners. Really any Pflueger spinning reel is going to be a great choice for getting started with bass fishing. The Supreme and President XT each cost a little more but stay under the $100 mark. 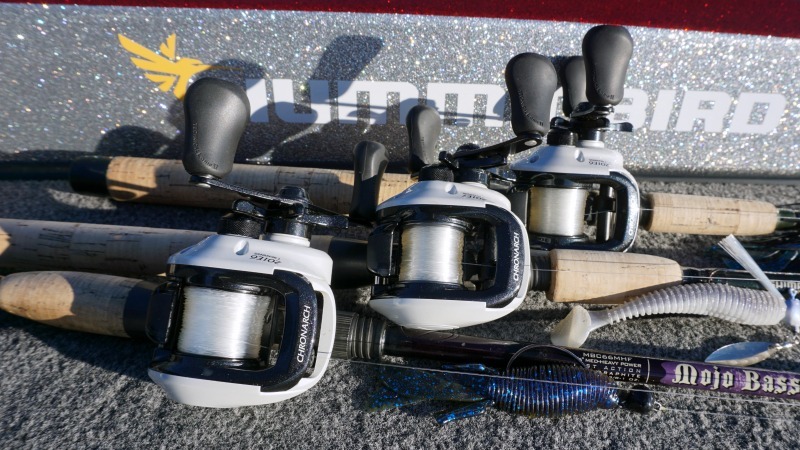 Abu Garcia Orra2 S – The Orra is very similar to the Revo series, but at a more attractive price. You still get a carbon body and Carbon Matrix drag stack. It weighs less than 10 ounces, plenty light enough for finesse bass fishing. Shimano Sahara – The Sahara has been around a long time and is very popular. Over the years this affordable beginner reel has been upgraded with the same technology as the flagship reels. You get a sub 9 ounce reel, with 4+1 bearings, and X-ship pinion design. For the price it’s a great little reel. Are you already experienced with a spinning rod and reel? If yes, then a baitcasting rod and reel would be suitable for getting started with bass fishing. With a baitcasting combo you can cast heavier lures and use heavier line. A good baitcasting reel and quality graphite rod provides much more power when dealing with vegetation and fighting fish. It’s true there is a bit of a learning curve with a baitcaster, but it’s worth it because of all the advantages you’ll gain. It would be a good idea to practice casting in your backyard for a few days until you get used to thumbing the spool and using the casting brake systems with different lures and in different wind conditions. Fenwick HMG Casting Rods – Bass casting rods that are sensitive, lightweight, and durable. Just like the HMG spinning rods, the HMG casting rods are hard to beat. St. Croix Mojo Bass Casting Rods – The Mojo Bass casting rods are technique specific rods, but still versatile enough to work multiple types of baits. Get the “Jig/Baits” MH action rod for all around usage, and the “Plastics” M action rod for everything else. Abu Garcia Veracity Casting Rods – Abu Garcia doesn’t just make good casting reels; the Veracity rods are excellent for bass fishing. They have the very popular micro guide system that helps anglers make longer casts. You can fish anything you want with those rods. Abu Garcia Revo S – The Revo S is an easy to palm, low profile baitcaster. It has a gear ratio of 6.4:1 which makes it great for a variety of presentations. The Revo line is known for their strong yet smooth Carbon Matrix drag system. Shimano Citica – The Citica comes in standard 6.3:1 and high speed 7.2:1 gear ratios. In recent years the Citica has been upgraded from an entry level to now a mid level reel. It is basically what the Curado used to be, and that is a very good thing. Pflueger Supreme – The Supreme is a great budget baitcasting reel for bass. The reel materials are top notch, and the 8 ball bearings provide a smooth operation. The Supreme also boasts a solid magnetic braking system, which is crucial for good casting. For your spinning reel, I don’t recommend using anything heavier than 10lb diameter line. It becomes increasingly difficult to cast a medium bass sized spinning reel with anything heavier than that. So listen to that advice if you want to save yourself frustration with bird nests and terrible casting distance. Here are excellent options in both monofilament and braided line for your bass fishing spinning reel. For baitcasting reels, you can choose the same lines but increase them to 15-20 lb mono, and 30-50 lb braid. 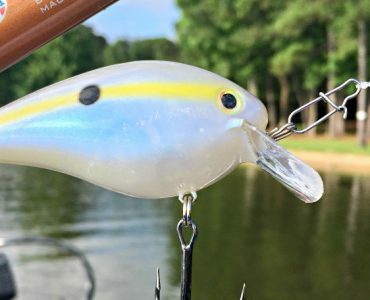 Monofilament – Mono is a great line for beginner bass fishermen because it’s affordable and easy to use. Mono is the cheapest and easiest to handle, but you risk breaking off more lures because it’s more prone to getting nicked up on rocks and wood. Flourocarbon – Fluoro is extremely popular, but I don’t recommend a beginner use it on spinning reels. If you want to try it on baitcasting gear, a good starting point is 12 or 15lb test. Learn to tie a good Palomar knot, making sure the line strands never cross each other. We recommend using a good line conditioner to reduce the stiffness and prevent bad backlashes. Braid – A braided superline has smaller diameters for equal strength, and are far tougher than mono. Casting and handling braid has a learning curve, and cost more initially, but they last much longer than mono. There are dozens of styles of bass hooks to choose from and it can be confusing. It doesn’t need to be that way for a beginner. For fishing soft plastic baits, the best hooks are Offset Wide Bend and Offset EWG (Extra Wide Gap). Use the Offset Wide Bend on Texas rigged worms and creature baits. The hook point is offset from the bend and eye, creating instant penetration on the hook set. Some people prefer EWG hooks for plastics, and it may work for them. All I can say is an Offset Wide Bend has rarely failed me when fishing weighted soft plastics. The Offset EWG style hook is great for weightless applications, such as a Senko or Fluke style soft jerkbait. The bend in the hook aligns the point with the shank and eye. This means you can rig the hook “Tex-posed” on the weightless bait and get better hookups. Palomar Knot – Most beginners don’t know the Palomar knot. It’s just not taught to most kids when they first try fishing. This is the fastest, strongest, and easiest bass fishing knot and it pays to learn this knot right away. It works equally well with mono, fluoro, and braid. Tie this knot directly to your hooks and lures. Some people complain of broken knots with fluorocarbon, but the simple fact is they are tying the Palomar incorrectly. The key is to never cross the strands of line. When the line lies clean, they slide and cinch without generating heat that weakens the line. I have literally never broken a Palomar knot in all my years of fishing. Alberto Knot – Where the Palomar knot will be your everyday workhorse knot, the Alberto will be your money saving knot. Use this knot to connect different lines together. 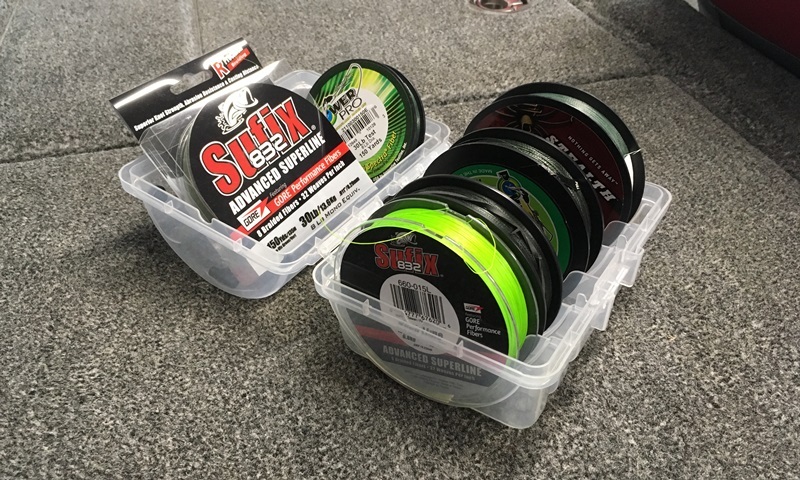 You save money on line by using a cheaper (mono) or more durable (braid) main line, and connecting a leader of the more expensive good line (fluorocarbon) to it. When it’s time to replace the line, you only have to replace a leader length or partial spool of line versus the whole thing. Over the course of a season the cost of good line adds up. For a spinning reel, use a braided main line, and when the situation calls for finesse, you can use the Alberto to tie on a 5-10 foot 8-10lb fluorocarbon leader. On baitcasting gear, you can fill up half of the spool with cheap monofilament and the rest with your favorite fluorocarbon. A Texas Rig is the most basic bass fishing rig there is. Slide a bullet weight onto your line, and tie on an offset worm hook. The weight slides freely up and down the line, creating an action that is hard for fish to resist. Any kind of plastic bait can work on a Texas Rig, but the most common is a worm. A regular bass worm has a curl tail that flutters in the water. There are also straight tail worms like the Trick Worm or Senko. If the bass don’t respond to a curly tailed worm, try a more subtle straight tailed version. The Senko style soft stickbait is an awesome bass lure for beginners. Rig the 5” worm weedless texas style on a 3/0 or 4/0 offset worm hook with no weight. This rig will fall slowly through the water column with a seductive shimmy that bass love. Cast the Senko to any visible piece of cover and let it fall on a slack line. That’s all you have to do. If you see your line jump or move off to the side set the hook! For a different look, tie on a small wacky rig hook and rig the worm right in the middle. This is “Wacky” style fishing, and it’s deadly on bass. The main drawback is the rig is a little less weedless compared to texas style. 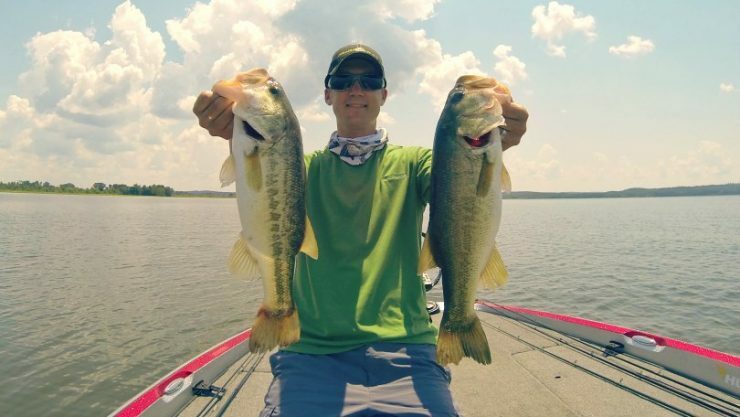 A buzzbait and topwater toad are two very different baits that create a similar presentation. Both are great fished over the top of grass, wood, and rock. 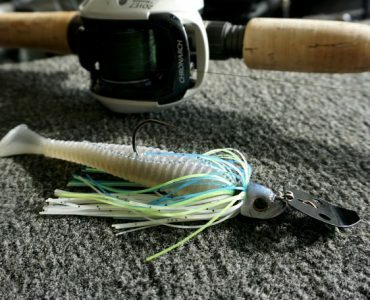 Both lures create a commotion in the water that draws bass attention. Looking closer you will see the big differences. Buzzbaits are wire formed baits with a square blade that rotates on the top wire. The blade makes a loud squeaking noise, sometimes in tandem with a “clacker”, and churns up bubbles in the water. Some are skirted like a spinnerbait, while others have a small lead head and can be tipped with soft plastics. Toads are rigged like other soft plastic baits, with an EWG offset worm hook. The deal with a toad is you need to reel it in quickly to get it to stay on top and the legs kick and turn to churn up the water surface. Toads can more easily be fished over the top of heavy vegetation without getting hung up. Both of these lures are dead simple to fish. All you do is cast them out and “slow roll” them back in, and working the bait with your rod tip. Slow rolling just means reeling it in as slow as you can while keeping it hovering over the bottom. The swim jig is more compact and can be fished in heavier vegetation. If you’re just getting started, don’t buy a tackle box. Get a good tackle backpack and Plano style boxes instead. You can easily take your fishing backpack on your bank fishing trips or on your friend’s boat. It’s far more efficient to carry your gear on your back than it is a bulky plastic box. It’s also more versatile. You can stuff side pockets with soft plastics or line or whatever else you need for that trip. There are a half dozen other fishing accessories you’ll want to get and keep with your tackle bag. A good set of aluminum fishing pliers to remove deeply embedded hooks. Pliers are also necessary when using lures with treble hooks. To cut your line, a small set of sharp scissors is needed. Small sewing and fabric scissors work great for fishing. A handheld digital fishing scale for weighing your fish. You never know when you’ll get the bite of your life. Make sure you have a good scale to make the weight official. Small telescoping fishing nets can strap to your pack. This is especially useful when fishing from tricky spots on shore. Polarized sunglasses reduce the strain on your eyes, reduce the suns glare off the water, and help you see and observe what’s going on around you. This was a long introduction to bass fishing for beginners, so it is helpful to summarize into a few simple steps. Think about where you are going to fish most often, whether from the bank or boat. Let that guide your initial equipment choices. Pick out one or two spinning rod and reel combos. Spool them with 8-10 lb mono, or 15-20 lb braid, and buy some good fluorocarbon for a leader when necessary. Practice tying your Palomar knots until they are perfect. Rig up your rods with the two lures best suited for the location you’ll be fishing. Be sure to pack some alternative lures in your tackle bag. Get out there and fish! Learn to read the water and where fish might be positioned. 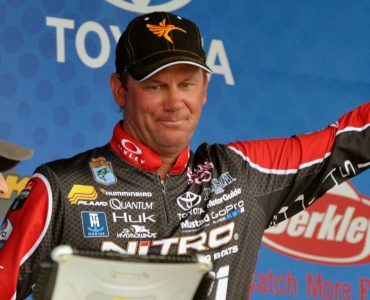 Time on the water is the best way to improve as a bass angler.